Freshwater angelfish comprise three different native species in the Pterophyllum genus: P. scalare, P. angelfish, and P. altum. Those sold as domestic aquarium pets are usually varieties of the P. scalare species, although they can be somewhat confusing to identify genetically, as the species cross-breed easily. Some varieties may be crosses between P. scalare and P. altum. Domestic freshwater angelfish are the result of many years of selective breeding of various color attributes, such as background body color, striping, spotting, "blushing," marbling (orange and black). The aquarium trade offers many different color variations, although some may be difficult to find. Silver angelfish have long been the backbone of the angelfish trade, and are the color variation that most closely resembles the wild species. All silvers have three stripes—one through the eye, and two more through the body. They are quite hardy and among the easiest of angelfish to care for. This interesting variation is known as a zebra angelfish. Although the stripes in this specimen are not dark, you can see that there is a total of four stripes: one through the eye and three more on the body. The presence of four to six stripes distinguishes the zebra from the silver angel, which has only three stripes. Note the red eye in this fish, which is a sign of full maturity and good health. Not all varieties develop the red eye. The koi angelfish has been bred to have coloration resembling that of the Japanese koi. The koi angelfish has a mottled black and white coloration, and depending on the selected genes may have varying amounts of gold on the head. When young, the fish may have a red hue below the eyes that fades with age. The amount of orange varies according to the stress level of the fish; the specimen shown here is "blushing." The koi variety is similar to the gold marble color variation​ but without the stripes. The black marbling varies from 5 to 40 percent coverage, depending on the genetics of the parents. Pterophyllum altum, more simply known as the altum angelfish, is not commonly seen in the aquarium trade. It is larger, deeper, and flatter than the common freshwater species, Pterophyllum scalare or than the cross-bred mutations. It is notable for have an overall silver body, with brown or black vertical stripes. Altum angelfish are far more sensitive to changes in water conditions, and therefore more challenging to keep in an aquarium, but the fish is well worth the extra effort. Expect to pay a little extra for them as well, as they are far and few between in pet shops. The black lace variation is a silver or zebra angelfish in which extra black genes are present, resulting in a very dark fish with an elegant lace pattern to the fins. It is considered one of the most attractive of all angelfish. The lace angelfish was first bred in the 1950s. In the late 1960s, an Angelfish breeder in Milwaukee was surprised to find an oddly colored fry in a spawning of black lace angels. That single fish eventually resulted in the naja gold, which became the first gold angelfish in the aquarium trade. Several lines of golden angelfish have arisen and died off since then. Currently, golden angels are relatively common in the aquarium trade and are cross-bred with other varieties to create many interestingly colored specimens. The recessive gene causing this color variation manifests in a light golden body with a darker yellow or orange hue on the crown of the fish. Here, the blushing gene is in full display. Blushing is caused by a lack of pigmentation that allows the color of the gills to show through. Many other color variations feature the blushing gene in some measure, but the variety known simply as blushing angels typically are silver or white in color. Notices that this one has no dusky markings at all and no hint of stripes. The only coloration is in the flushed, blushing cheeks of the fish. Can you pick out all the variations in this lovely fish? It definitely has veil genes in its makeup, as well as blushing cheeks. This fish also displays dusky black edges to the fins. Blushing angelfish are among the most difficult to breed and are very sensitive to water conditions. But their beauty more than makes up for the extra effort required to keep them. Here's an angelfish variety that you won't see every day. Known as a half-black angelfish, this type has been around for well over a half-century. The fish are typically silver in color with a darker rear portion. Additional color traits, such as marbling or blushing, are sometimes also seen. Half-black angelfish aren't easy to raise, and because they are not in high demand, they are rarely seen for sale. There are many color variations that include genes for color marbling—a mottled arrangement of coloring that forms a unique pattern in every fish. Here is a classic marble angelfish, showing the distinctive marbling on the body, coupled with stripes on the fins. This specimen has a dash of gold thrown in, making it particularly attractive. Who wouldn't want this gorgeous pair of golden marble angelfish? Marbled angels have been around since the late 1960s, and show a wide range of marbling in the color markings—no two fish will be exactly alike. Here, both fish have strong golden traits with a slight variance—the fish on the left has far more black than the one the right, and the fish on the right shows blushing cheeks. Gold marbles are often considered a type of koi angelfish. Now here is a classic pair—a gold and a silver angel together. 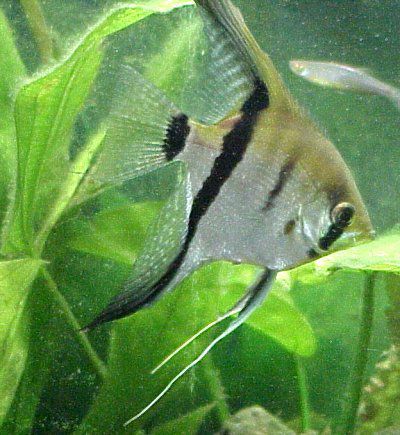 Note that the silver angelfish has only two stripes, a somewhat unusual and interesting variation. You can also see the difference in the eye—gold angels rarely sport red eyes, while silver angels usually do.